The western red cedar (thuja plicata) and the less common white cedar (thuja occidentalis) are evergreen conifers that belong to the thuja genus of the cupressaceae, more commonly known as the cypress, family. Although cedars are part of the pinaceae (pine) family rather than the cypress family, these thuja species are commonly referred to as such. Cedar hedges are a good alternative to Leylandii hedges and Lawson cypress hedges, as cedar hedges are hardier and regenerate from old wood, which facilitates hard pruning. Also, they are slower growing than Leyland cypresses – with a decent average of 30 centimetres per year as opposed to the top speed growth rate of 70 to 90 centimetres per year of the Leylandii – which can easily get overgrown without providing the possibility for rigorous cutbacks. The aforementioned species are the most popular species for thuja hedging, with the western red cedar being more common in the UK. Thuja plicata is generally slightly faster growing than thuja occidentalis and can make larger hedges if required, but they are both perfectly suited for normal garden hedges around 2 or 3 metres tall. 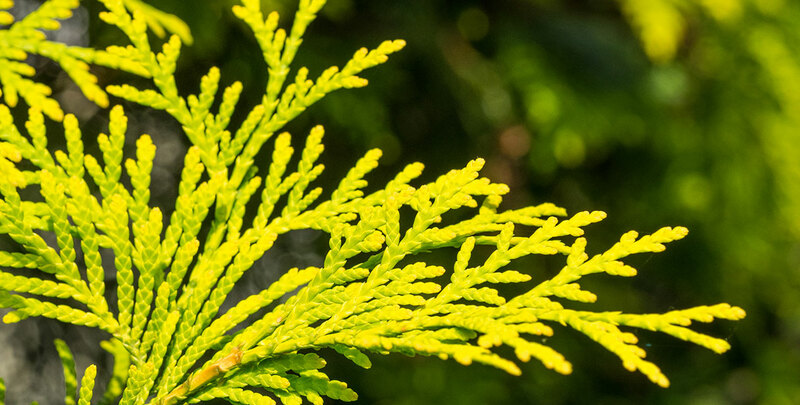 Thuja have glossy, bright or dark green and very aromatic – almost pineapple-like – foliage. The species produce small cones and provide nesting opportunities for birds, which also contribute to the fact that they are considered a livelier and more aesthetically pleasing alternative to the highly popular Leylandii hedges. 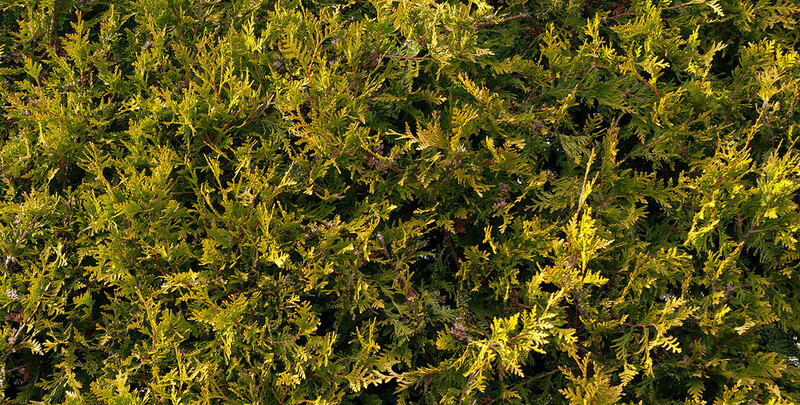 Thuja hedges have a bushy growth habit and make excellent screening hedges of 1.50 metres and upwards. None of the species and varieties are suitable as low or slim hedges. Both of these thuja species are native to North America. As for its specific native range, the botanical name of the white cedar may be a little confusing, as “occidentalis” means “western”, but the species originates from the east coast of the United States and Canada, while thuja plicata is actually one of the most common trees in the Pacific Northwest. The other three of the five thuja species in existence are native to East Asia, but the North American species are most suitable as ornamental plants in European gardens. In fact, the western red cedar has even become so accustomed to the climate in our part of the world that it is now naturalised in the UK. In the American horticultural trade, thujas are commonly referred to as “arborvitae”, which literally translates to “tree of life”. This name technically refers to the medicinal properties that the sap, bark and branches of thuja species are said to possess, but it is also a very fitting nickname for plants from this genus, as both the western red cedar and the white cedar are evergreen and very resistant to diseases. 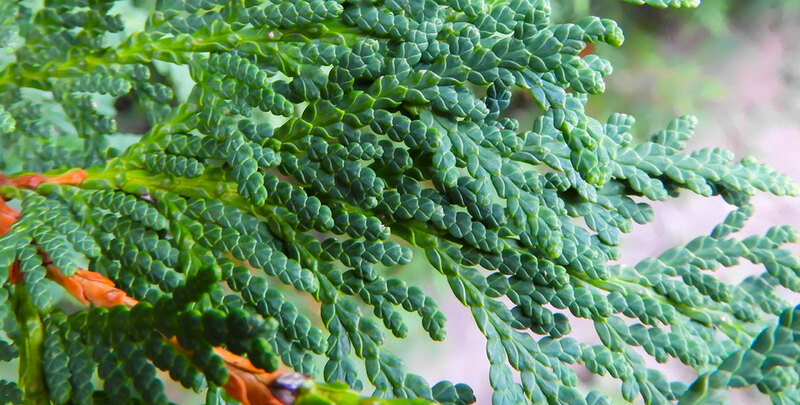 In addition, thuja species have an exceptionally long lifespan. There are living specimens of over a thousand years old, while the remains of dead thuja trees have been found that were around 1,500 years old when they died. Both the white cedar and the western red cedar are also very hardy. Therefore, it is safe to say that these species are strong hedging plants. 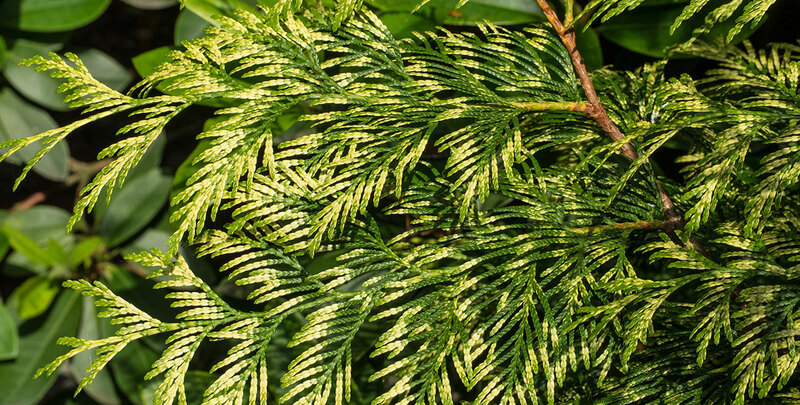 While the French explorer Jacques Cartier brought the thuja occidentalis with him from North America for its medicinal qualities, specifically to cure scurvy among his crew, it quickly became a highly popular ornamental plant throughout Europe and the UK. As such, it was the first North American hedging plant to be exported to Europe. Since it is very hardy, it was one of the very few hedging plants that would survive the harsh Central European winters at that time. Thuja hedges will take sun or partial shade and will thrive in any fertile, moist and well-drained soil, though waterlogged soils should be avoided. A thuja hedge is best planted in a soil that is rich in humus, although it will be able to handle chalky and acidic soils. Thuja hedges can be kept at any height or width you like, as long as they are regularly trimmed. For these slow growing thuja species, pruning your hedge once a year should be sufficient. Western red cedar and white cedar hedges can be clipped to shape from June to early autumn. Make sure you do not prune too rigorously, however, as these thuja species are unlikely to recover from being cut back all the way to old wood. In addition, make sure to water the saplings well during the first years after planting. If maintained properly, both the western red cedar and the white cedar will provide you with a dense privacy hedge for a long time. Even if they do not reach the aforementioned exceptional lifespans, they will last well over a lifetime. The white cedar and the western red cedar are among the most popular conifers for hedging purposes and it is easy to understand why, as their dense, fragrant foliage will guard your privacy for more than a lifetime and moreover, it simply looks beautiful throughout the year, as its fresh, green leaves will remain on the plant even during the coldest winter months. Anyone looking for a handsome hedging conifer who is somewhat intimidated by the rapid growth rate of the Leyland cypress should consider one of these two thuja species, as it has many of the same qualities and is therefore a very suitable alternative. If you are willing to give this “tree of life” the attention that it requires, it will last for years.